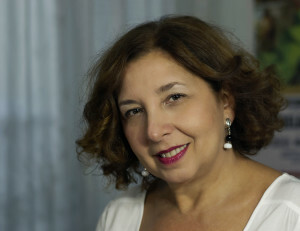 Angela Colombo started studying the piano with Emanuele Occelli, and got her diploma in 1977 under the guidance of Carla Sallustio Occelli, at the “Antonio Vivaldi” Conservatory in Alessandria. She continued her specialization studies with Felice Quaranta, Bruno Mezzena and, at length, with Gino Gorini in Venice. Subsequently she began, and pursued, her artistic career both as a soloist and as part of a piano duo with Linda Bosticco, performing in various venues, making recordings for RAI (the Italian Television), and winning some national and international awards (Stresa, Albenga, Bardolino). In 1984 she started her collaboration with the actress Laura Panti, with whom she formed the first duo in Italy to reintroduce the Melologue; they performed on stages both in Italy and abroad, presenting historical repertoires (Liszt, Schumann, Poulenc…) as well as pieces purposely written for the duo (Liberovici, Pacciani..). She started teaching Piano as Main Instrument in 1977 at the “Istituto Regionale della Valle d’Aosta”, the “Istituto Perosi di Biella” and the “Scuola di Musica di Bra”. She was also a teacher for the Music Training Courses in Turin, organized by the city’s Educational Department, which were were devised and organized by Felice Quaranta, former Director of the “Vivaldi” Conservatory. Since 1980 she’s been permanent staff member at the Conservatory in Alessandria, as teacher of Piano as Main Instrument. On numerous occasions she was a member of Examination Boards in competitive exams and professional evaluations. In 1990 she was a member of the Piano Evaluation Committee in the the State Examination for teaching posts in Music Conservatories, issued by the Ministry of Education. In 2004 she was President of the Examination Board for the Final State Exams at the Secondary Music School annexed to the Consevatory of Turin. In 2006, as part of the International Exange Program “Leonardo”, she spent 15 days in Barcelona, where she had a chance to train and compare teaching-learning experiences at the “Escola Superior de Música de Catalunya (ESMUC)”. She took part, as a speaker, in several confernces, and in April 2011 she organized, together with Silvana Chiesa, the ” Giornate di studio Scuola d’ascolto, scuola in ascolto” (a workshop on the theme of learning to listen and a school that listens). In the academic year 2001/02 she took on the assignement of Assistant Director of the Conservatory, over the past two trienniums she’s been member of the Academic Board and she is presently head of the Keyboard Instruments and Percussions Department. For many years she’s been dealing with the ideation and organization of concerts and performances, courses, seminars and masterclasses. Many of these events have been organized in collaboration with private or pubblic institutions, and Music Training Schools that have agreements with the Conservatory. Up to her nomination as Director in 2012, (and reconfirmation as Director for 2015/18) she was Head of the Office of Coummunication and promotion of the Vivaldi Conservatory.